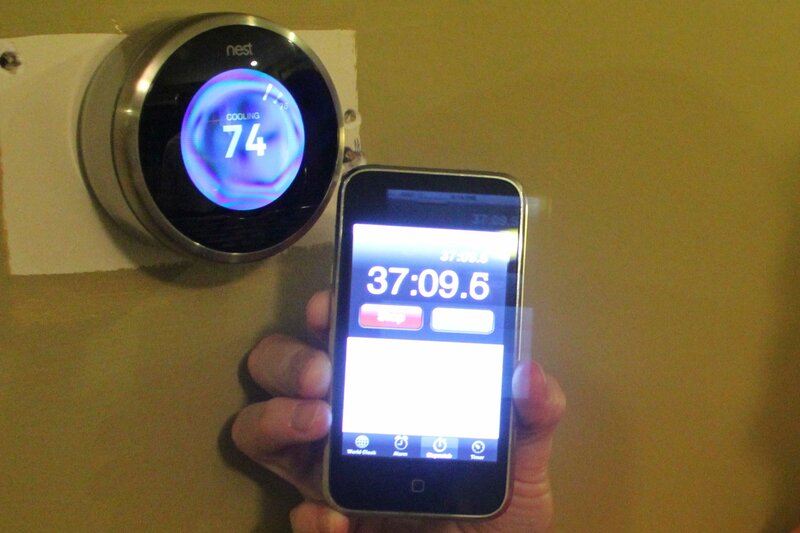 tl;dr: Nest Labs performs magic – making energy efficiency awesome, even for the nontechnical and non-green. We’re delighted to invest in the company. And then it sat in the box for four months. It’s not that I didn’t want a beautiful piece of industrial design on my wall – it’s that I believed installing a thermostat was a perilous project that would consume a weekend afternoon. Every time Mrs. Nordan and I thought “you know, we really ought to put that thing up,” we quickly found a reason to do something else. And so it sat in the box. Until June, when my colleague Matt Trevithick came over for dinner and asked me how we liked our Nest. I sheepishly responded that it hadn’t made it to the wall. Matt assured me that the setup was super-easy (he had one) and declared that we’d be doing the installation that very second. Mrs. Nordan and I accepted the challenge. The ground rules: she’d 1) do the whole thing, 2) use only what came in the box, and 3) time it (it’s supposed to be a half-hour job). If you want the details, see this photo log, but the bottom line is that Matt was right. The entire process was simple; every conceivable thought was given to user-friendliness (down to the bubble level built into the backplate, so as not to install the thing crooked); and the network and app connectivity “just worked.” We clocked in at 22 minutes for the install, followed by 15 minutes’ worth of software updates (that’s what I get for waiting months to activate the thing). Done. Niche nerd product: operational. The experience was legitimately great. Our old beige box seemed out of place in a house otherwise filled with stainless steel; the Nest just looked better. We never programmed the old box because it was so awkward; the Nest had an iPad app. Even basic stuff was better – the AC would kick right in after we set the dial on the Nest instead of incurring a mysterious delay like before. I’d thought that setting the temperature from your phone was a stupid idea, until I found myself doing exactly that when I’d land at the airport late at night and wanted the downstairs to be cool before I got home. It appealed to non-techies and the non-green. Most people who walked into our house and saw the thing wanted one, even those lacking a sustainability gene; they looked at it like an iPhone, not a climate controller. It became a living room conversation piece, like a stereo in the 1960s (I think of Pete on Mad Men). When Mrs. Nordan – a deeply nontechnical gadget-phobe – decided that it would make a great Christmas gift, the breadth of appeal became clear. It delivered energy efficiency effortlessly. Nest’s default mode is to learn your schedule and make your house more efficient – thus saving you money – without you having to do anything. Little things that are transparent to the user, like turning on just the fan instead of the A/C compressor when it makes sense to do so, simply happen; you don’t have to know (or care). Every Nest household is a potential demand response node that doesn’t require the utility to roll a truck. Combined, those homes are a trove of fine-grained data that can be used to target retrofits. I concluded that I wasn’t looking at a better thermostat. This was something else: the reinvention of an unloved category via thoughtful design. Nest was to its ilk what the Prius was to cars, what Tivo was to VCRs, or – best comparison – what Dyson was to vacuum cleaners (20% market share in the U.S. at 4x the average price point just three years after introduction). And if this team could make a thermostat (of all things) into an engaging product, who knows what else they’d come up with? 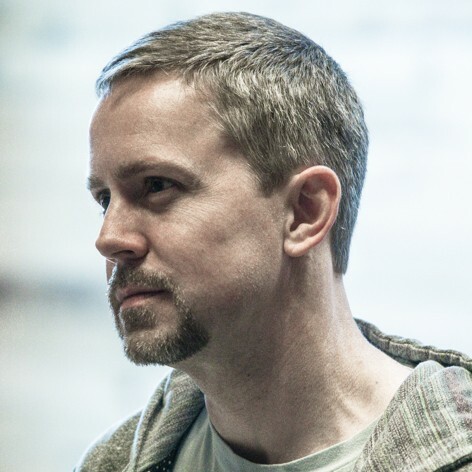 Shortly thereafter our energy team at Venrock evaluated Nest Labs as a venture investment. I’ve written before in this space that the smart grid has been a failure for consumers because it’s all too complicated and no one cares. To change the input/output ratio of consumption, the experience has to be awesome, winning on merits instead of getting by on shame. 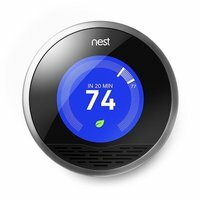 Having looked at this field for many years we’ve seen a ton of consumer energy propositions; Nest was the first one to clear this essential bar. We’re pleased that Venrock is investing in Nest and backing a phenomenal team with an expansive vision. Matt, Ray Rothrock, and I – all of whom happened to be users before we were investors – are on the case. For her part, Mrs. Nordan has the second Nest unit going in upstairs. This entry was posted in Consumers, Energy efficiency, Smart grid. Bookmark the permalink. Homes are getting smarter and smarter. The problem from the venture capital stand point is we are not attacking the problem on a community scale. While all of these devises are great, if you do not incorporate the ‘Whole-System’ design approach on the ‘enernet demand distribution intelligent’ smart community level we are just wasting time and money. The whole world is passing us by and designing and building entire communities addressing serious limited resource availability. Pike research and Panasonic says buy 2030 this will be a Trillion dollar market. Over 200 smart cities are being built world wide, yet no serious monetized project in America is under way. My question is WHY? Inspiring as usual, Matthew! Just thinking about coming home at the end of a long, ski weekend to a cold house has me looking at ordering the new version. More importantly (because I do program my thermostat), I like the idea of controlling the temp more during the week – right now it stays on the same program whether the kids have a vacation day or everyone is out of the house. If we save more during the day, maybe I can turn it up a bit more in the evening! My Nest has saved me money on my heating bill for years now. I don’t know why I ever even hesitated to buy one!